We’ve all been there. 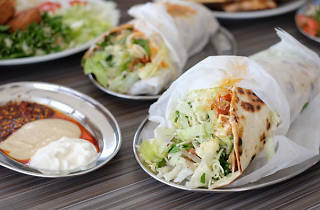 A late-night kebab loaded with meat and dripping with chilli sauce after a beer or three is a rite of passage. 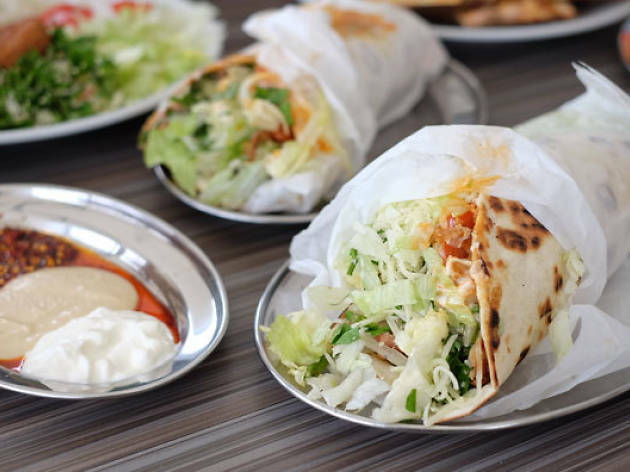 And even though New Star Kebabs is open late enough to help you kick that impending hangover to the kerb before it’s even begun (until midnight every evening), you’ll probably enjoy their kebabs even more when you’re sober. Seriously. It starts with the slowly spinning vertical rotisserie, jammed tight with chicken, lamb or beef mince. Pick your protein and they’ll carve on the spot, jamming it into a lightly toasted flat bread wrapped up with lettuce, tomato, onion and your choice of sauce. For only $8.50, you’ll score a monster-sized doner kebab. It’s as wide as a tree trunk – and that’s before you fork out the extra buck for tabouleh and grated cheese. The real stars of the show at this Turkish joint, though, are the shish kebabs, cooked on giant skewers that look like flattened swords. That’s no coincidence either. It’s said that Persian soldiers in the Medieval Age used their swords as makeshift skewers to cook meat over an open fire. Take your pick from seasoned, speared lamb mince, hunks of lamb or marinated chicken pieces. Get the mixed plate ($23) and you can watch it being cooked over glowing charcoal by the shish expert, who’s trapped in a glass booth that looks onto the street. Park yourself at a table and they’ll bring it out when it’s ready, along with a heap of salad, lemon wedges and side sauces of chilli oil, hummus and cacik, a thin yoghurt amped up with garlic. Underneath that layer of hot, smoky meat is a mattress of Turkish bread to soak up all the dripping juices. The Iskender plate ($15) offers maximum comfort food – shavings of doner beef drenched in yoghurt and tomato sauce with cubes of Turkish bread at the bottom. They do pizzas and gozleme too, but the Kiymali pide ($13/$15/$18) is our pick: a crisp-bottomed baked flat bread spread with mince, onion, chopped tomato and parsley. Squeeze over some fresh lemon, sit back and party on.